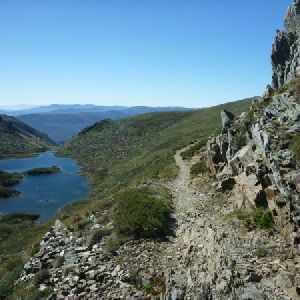 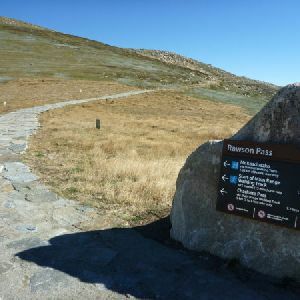 From Charlotte Pass at the lower end of the turning circle (at the end of Kosciuszko Road), this walk follows the ‘Snow Gums Boardwalk’ sign up the stone path. 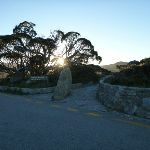 The walk soon passes a large rock (marking a track on the left), and continues up the stone path to wooden viewing platform, Charlotte Pass Lookout. 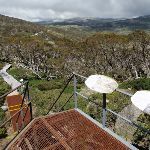 The Charlotte Pass lookout is a partially fenced lookout, north of the turning circle at the end of Kosciuszko Rd. 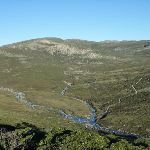 The view is great, looking up the headwaters of the Snowy River up to the Main Range. 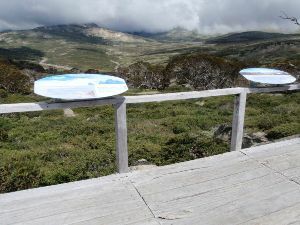 To the left is Charlotte Pass (the actual pass only – there is no view of the village from here). 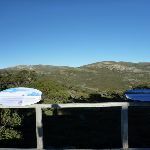 There are also a few information signs explaining the local flora and geology. 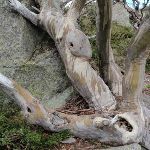 Snow gums (Eucalyptus pauciflora) are the dominant tree found in Kosciuszko National Park. 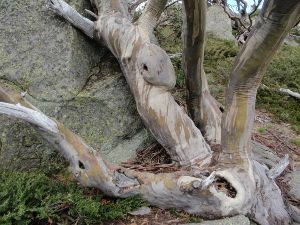 These slow-growing, distinctive plants have a light grey trunk with smooth red-brown bark, which peels unevenly with a mottled effect. 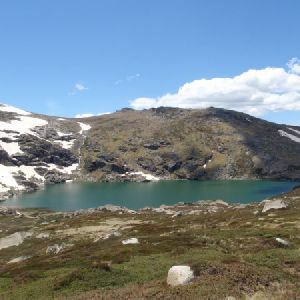 They can be found south along the tablelands into Victoria, and also in Tasmania. 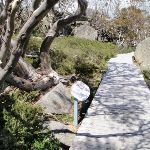 Trees are covered with beautiful white flowers from October through to January, which attract lots of bird life. 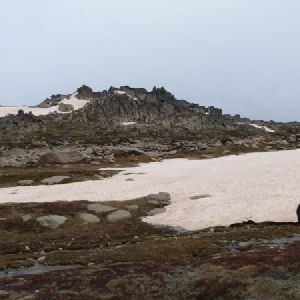 The alpine tree line is the highest altitude at which trees can survive, due to the cold temperatures. 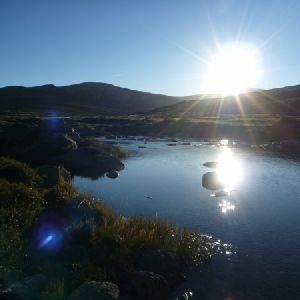 However, you will notice that, in some areas, there are no trees in the valleys, while they thrive on the surrounding hills. 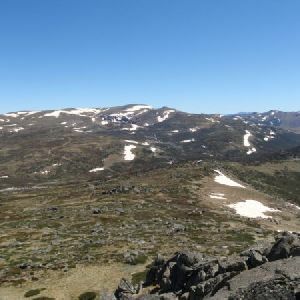 This is because cool air settles in the alpine valleys, making them colder and less hospitable than slightly higher altitudes. 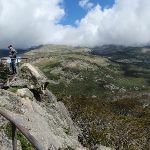 Continue straight: From Charlotte Pass Lookout platform, this walk heads along the wooden walkway, heading further away from the road. 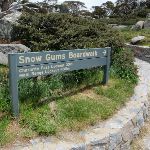 The walk initially heads down a number of steps and skirts around the edge of the Snow Gums. 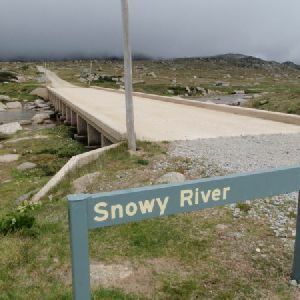 There are some great examples of snow gums that are growing around boulders and a few information signs about the trees, as well as great views down to the Snowy River. 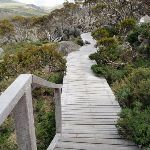 Before long, the walk climbs up a series of steps along the timber boardwalk. 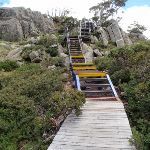 Soon the walk leads to, then climbs, a metal staircase (passing more information signs). 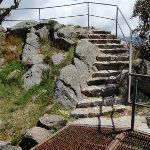 Here the stone steps lead left to access the Main Range Lookout. 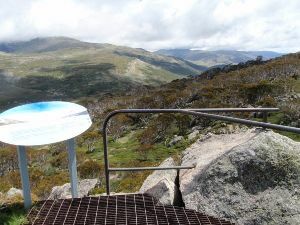 The Main Range lookout is a partially fenced lookout, perched high on a rocky promontory, providing 360-degree views of the Main Range, the Snowy River, Blue Lake track and many of the mountains in the area. 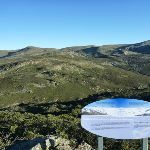 There are a number of information signs, adding interest to the view. 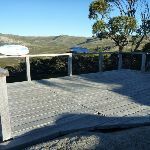 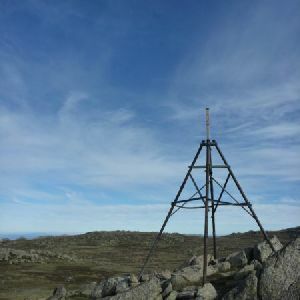 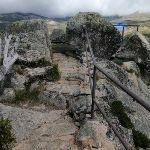 This lookout is very exposed to the wind and weather, but provides great views in favourable conditions – be sure to consider the weather conditions before climbing up. 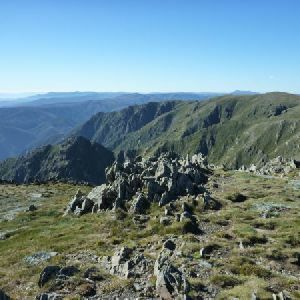 Around 160m of this walk has short steep hills, whilst the remaining 30m has gentle hills with occasional steps. 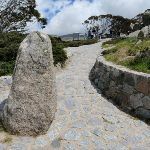 This whole walk, 190m follows a smooth and hardened path. 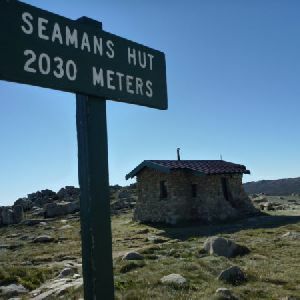 This whole walk, 190m is clearly signposted. 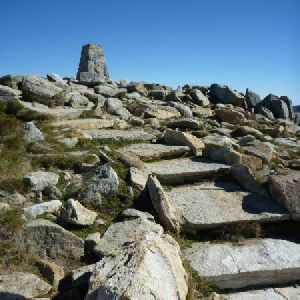 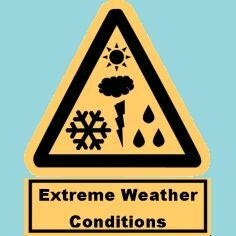 Around 160m of this walk is affected by storms that may impact your navigation and safety, whilst the remaining 30m is not usually affected by severe weather events (that would unexpectedly impact safety and navigation). 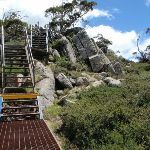 A list of walks that share part of the track with the Snow Gums Boardwalk walk. 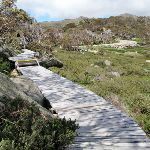 A list of walks that start near the Snow Gums Boardwalk walk. 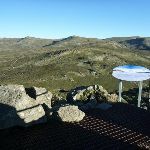 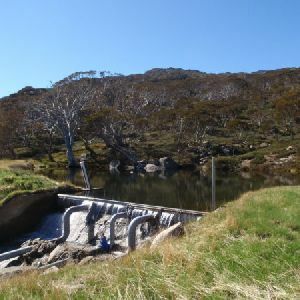 http://new.wildwalks.com/wildwalks_custom/includes/walk_fire_danger.php?walkid=nsw-kosciunp-sgb Each park may have its own fire ban, this rating is only valid for today and is based on information from the RFS Please check the RFS Website for more information.